PowerTicker is a platform that delivers real-time data, news and analytics to facilitate better-informed trading decisions. Equipped with powerful features, it promotes transparency of the financial market, giving institutional and retail investors to a more comprehensive picture of the market and individual stock performances. 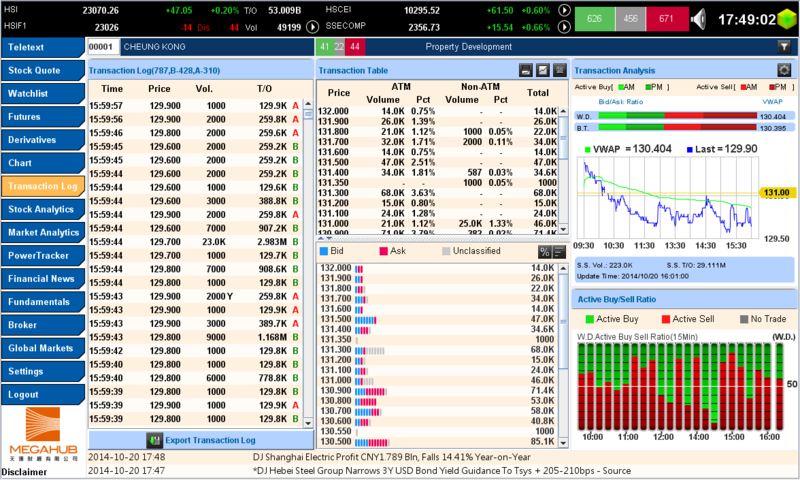 Monitor individual stocks and derivatives in a cohesive teletext interface, with Streaming Stock Quotes, Broker Queue, Transaction Log, Related Warrant/CBBC information, Technical Analysis Data, etc. 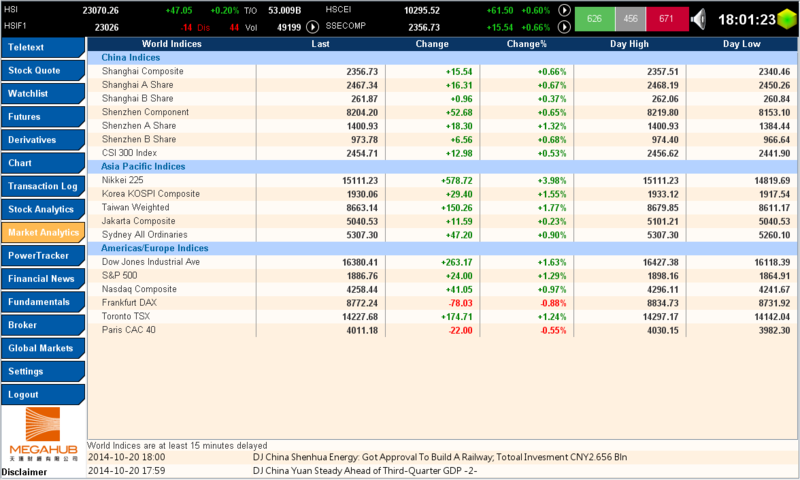 The quote updates with flashing color to let the investors keep pace with the stock market. 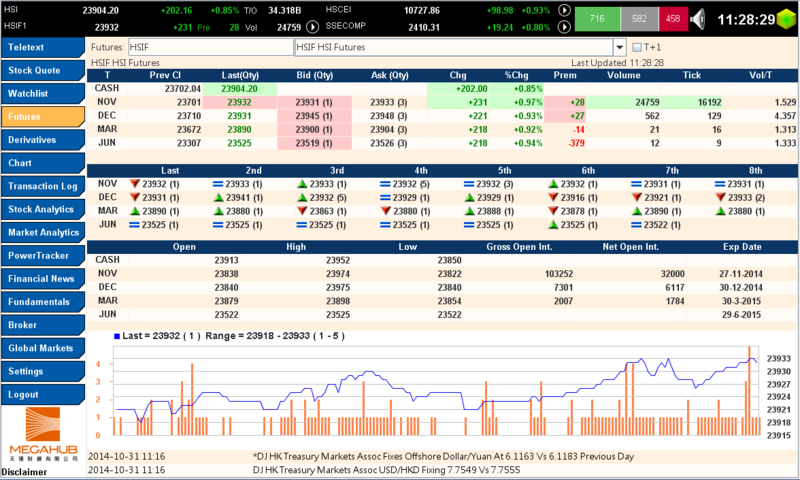 This layout features the chart alongside Streaming Stock Quotes, Broker Queue, Bid/Ask Queue, etc. to keep investors up to date with the latest stock movements. View two real-time quotes at the same time with the Dual Teletext. 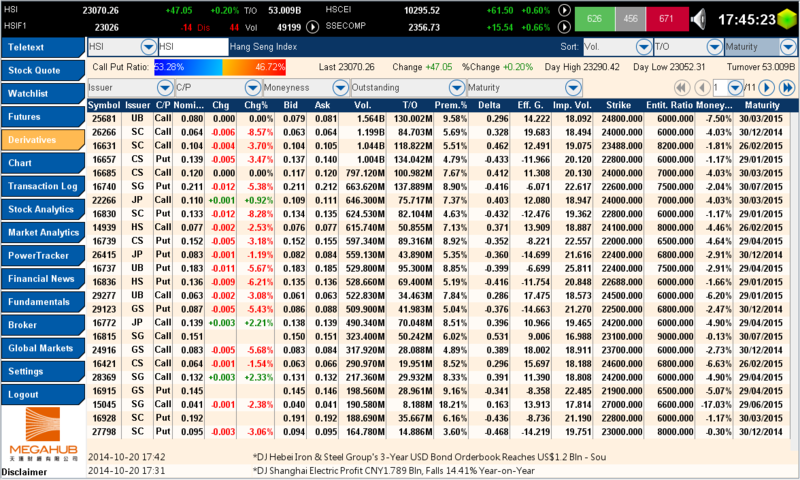 Users can select to view Quote, Watchlist, Top 50, etc. on either section. 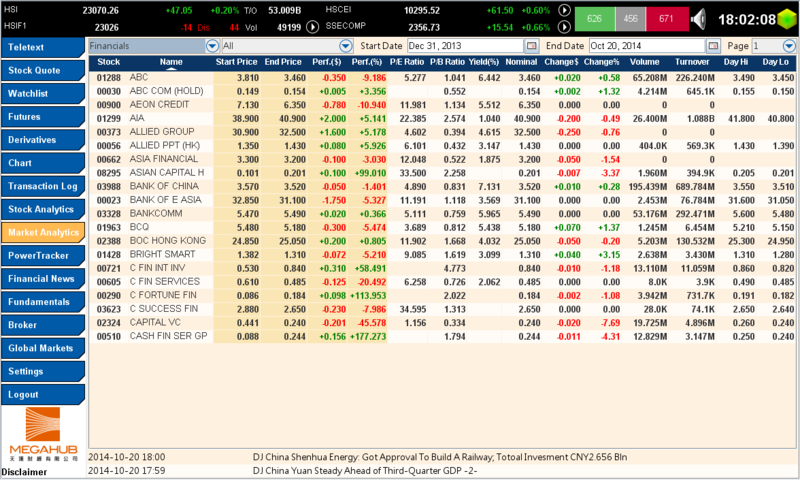 This layout is best used for comparisons between stocks or derivatives. 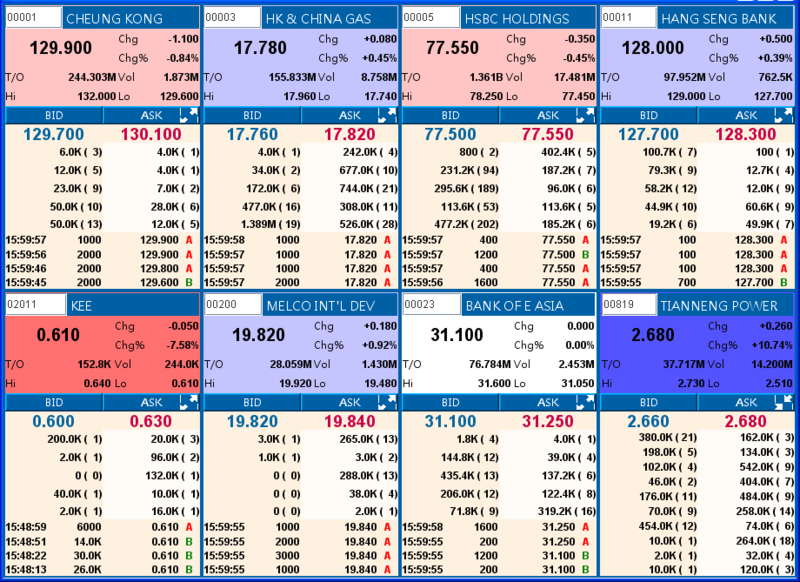 The Quad Teletext offers flexibility and variety, allowing the user to set any of the four sections to Quote, Watchlist, News, Dividend, World Index, Top 50, Fundamental, Chart, Futures, Forex, etc. 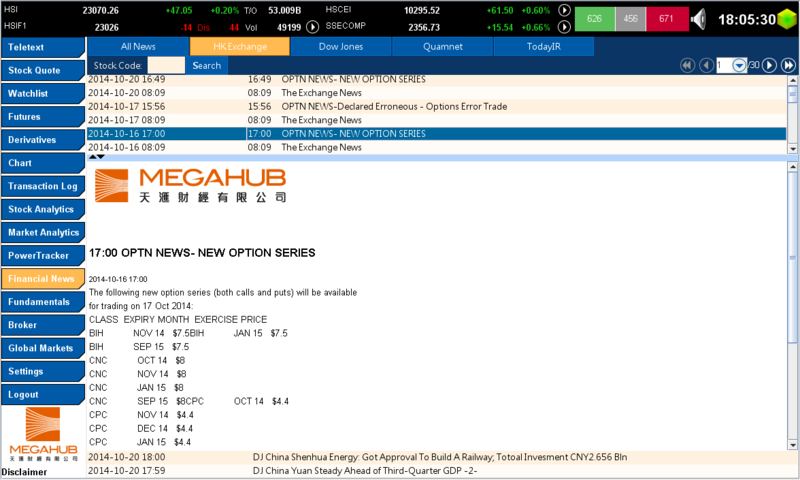 Monitor the price movements of 8 quotes on one screen with the MegaHub Teletext. The boxes change colors according to the magnitude of price change, for a clear look at the market trend. Recent transactions, bid/ask queue and other relevant information are shown. 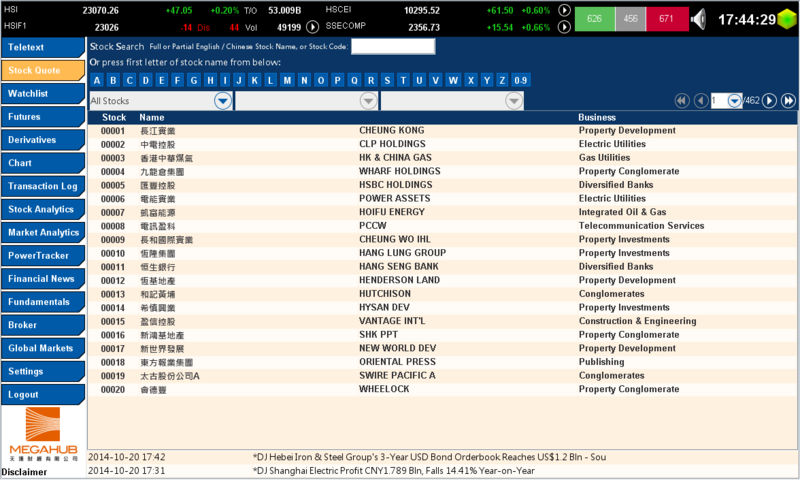 Search for a stock by its stock code or company name (Chinese and English are both supported). 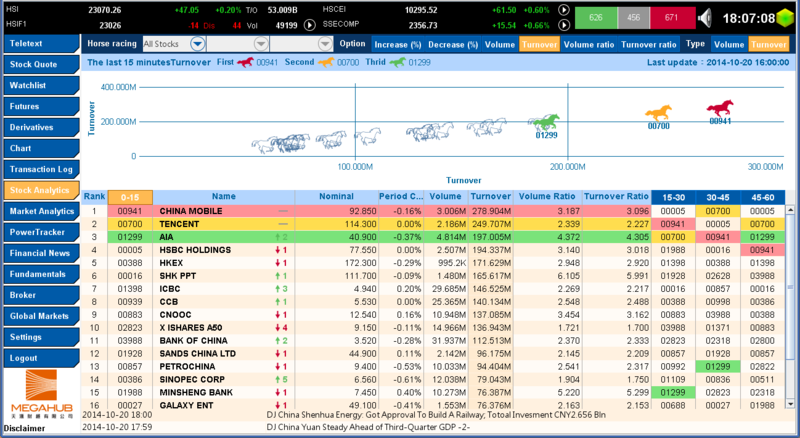 Users can also browse stocks by index or sector, for added convenience. 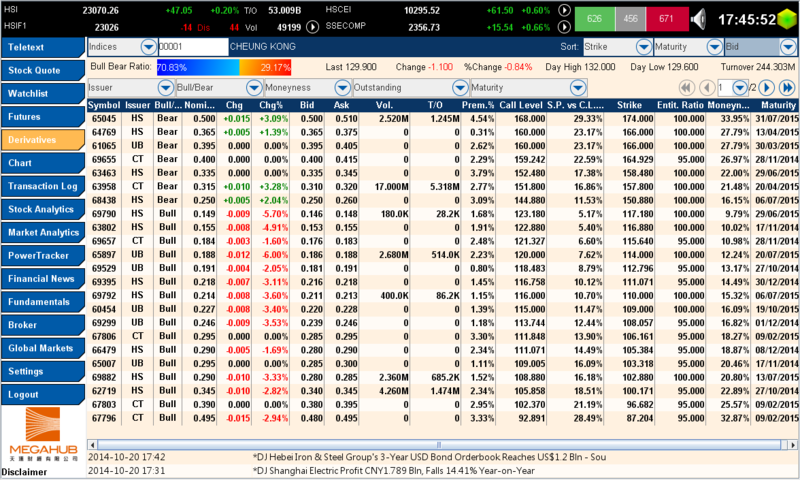 Users can set up multiple watchlists to monitor price movement and each portfolio can contain up to 20 stocks. Users can also enter the purchase price and quantity of each stock to keep track of their investments and to calculate portfolio value in real-time. 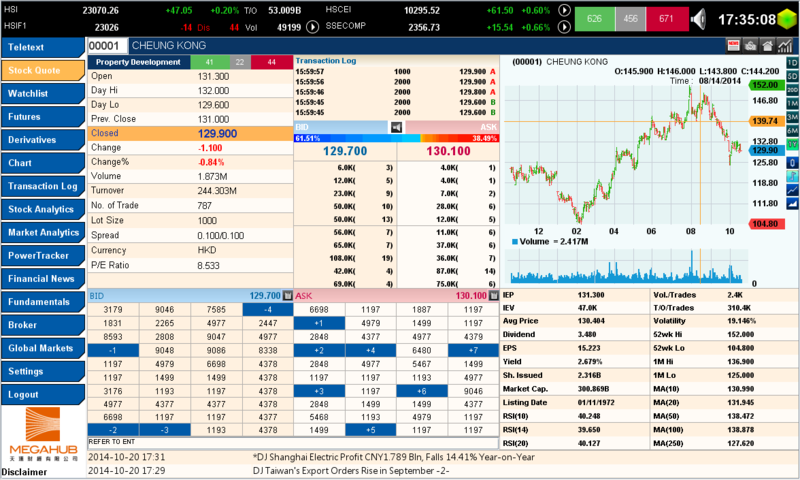 Shows equity index futures and stock futures, provided through the HKEx datafeed. Tick chart updates in real-time during active trading hours. 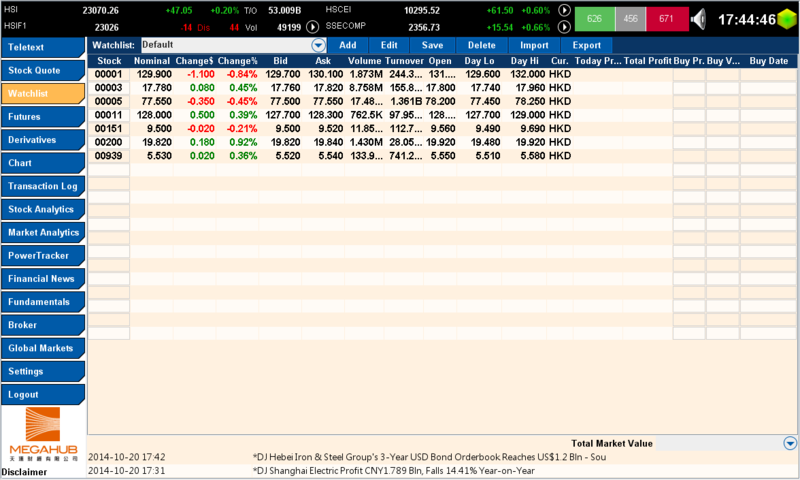 After-hours trading (T+1) is also supported. 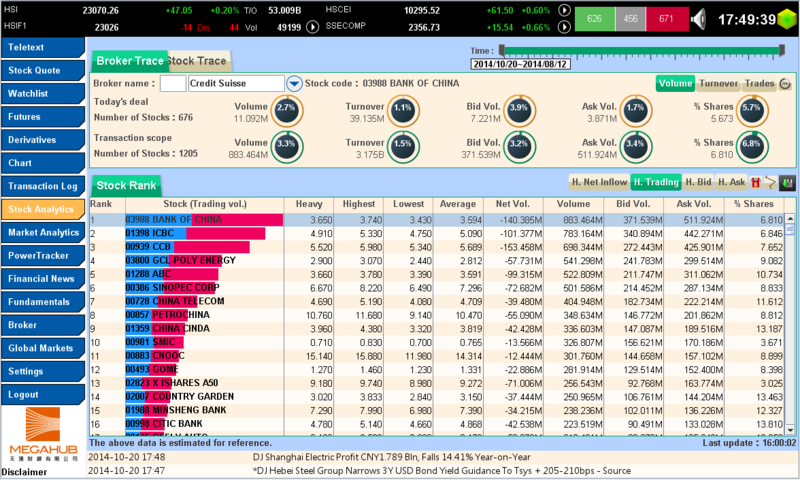 Search for warrants and CBBCs in this panel displaying leverage ratio, effective gearing, implied volatility, and other important indicators in table format. Data is updated on a real-time basis and user can set sorting criteria and filters, to better discover high-potential investments. 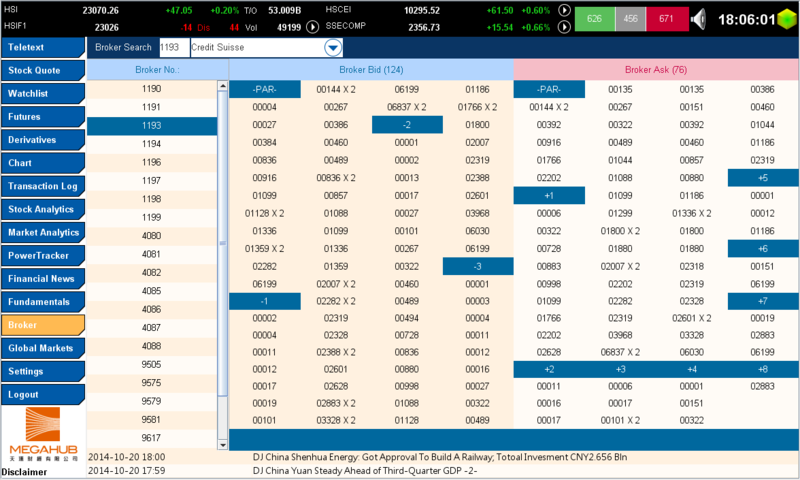 Our Interactive Chart is full of powerful features and can display stocks, major indices, and futures. 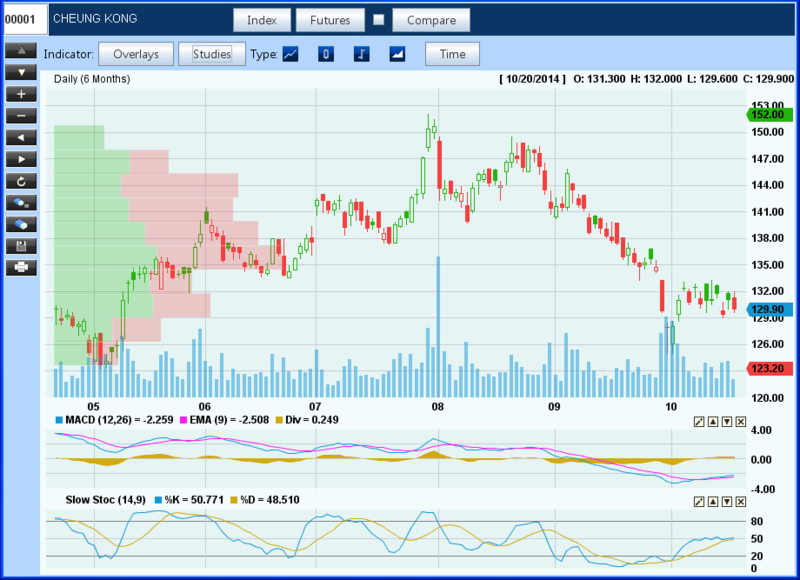 With 15 years of chart data, users can select different time frames as well as chart types. Advanced tools include over 60 technical indicators and drawing tools, with the ability to overlay multiple technical indicators on the chart. 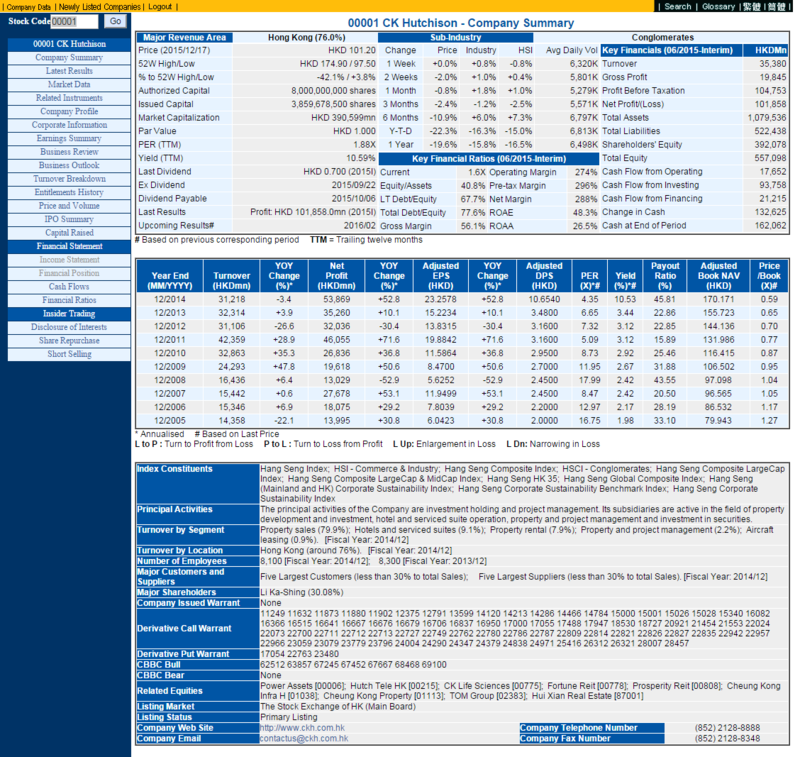 View the detailed transaction records for the day, with the transaction log, analysis, and active buy/sell ratio. Sorting functions can be used to easily track the price points with highest transaction volume. 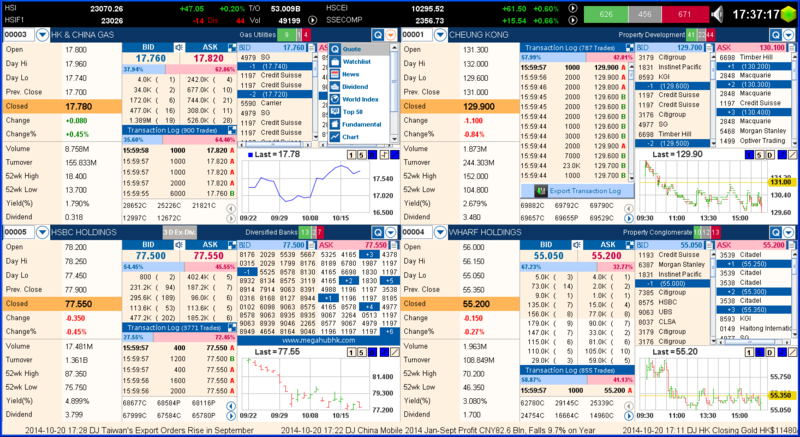 Available as an add-on feature to the PowerTicker terminal, Money Flow Pro is an advanced tool which identifies important support and resistance levels by analyzing trade transactions. With the use of this tool, investors can decide on buy and sell signals off of money movement patterns within a stock’s trading activity. Included in the same package as Money Flow Pro, the Major Players Flow keeps an eye on significant investments by large financial institutions. 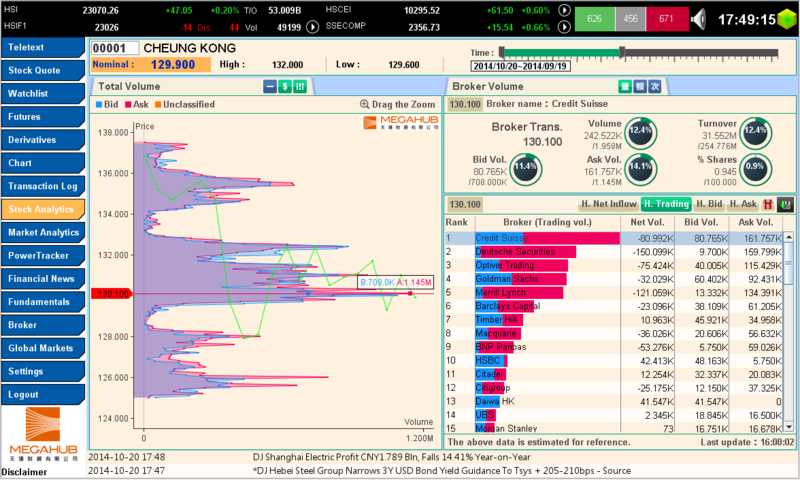 Users can track trading activity by stock or by broker to analyze its influence on price movements. Discover stocks with high potential through our innovative Horse Racing tool. 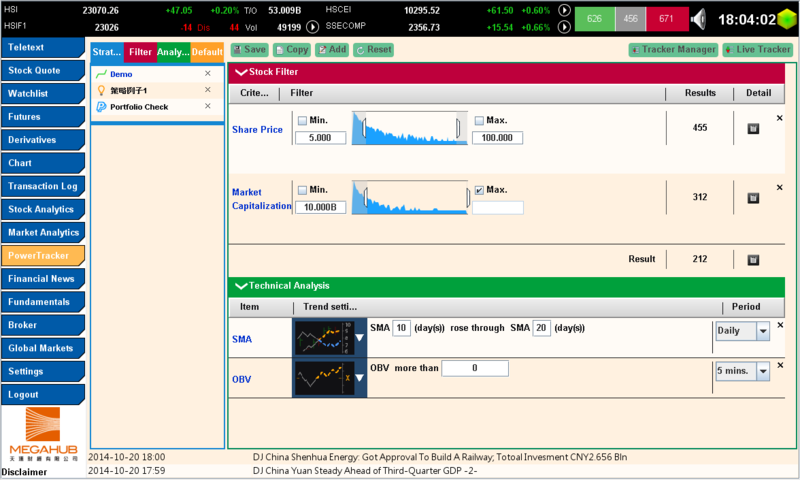 Users can filter by stock sector or index and view top stocks by volume or turnover. 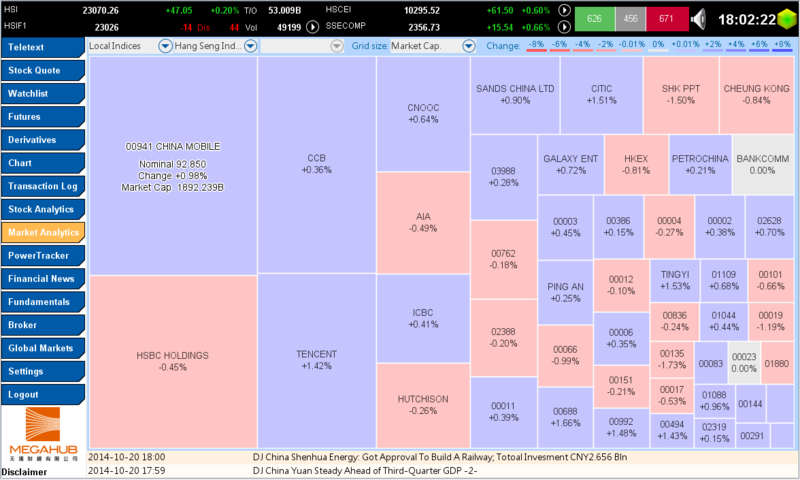 The MegaHub Heatmap provides an overview of different sectors and indices’ performance. Users can easily identify the market trend with boxes colored according to the intensity of the day’s % change. 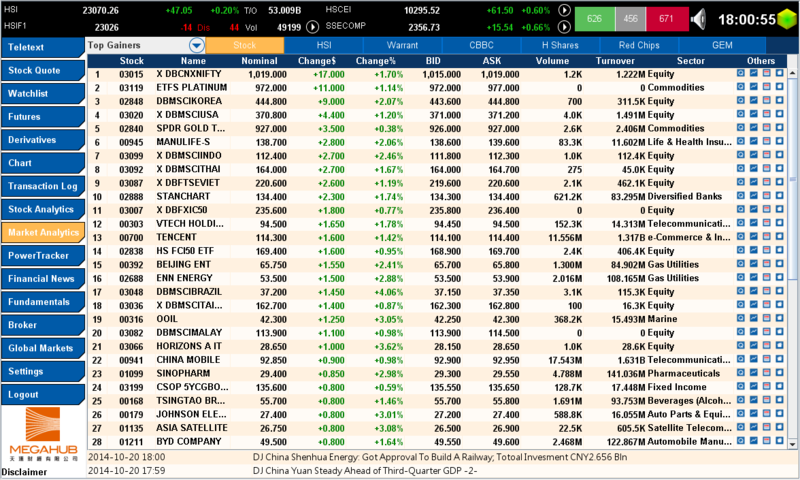 See the top 50 active stocks, warrants, CBBCs, H-Shares, Red Chips and GEM. Ranking categories include top gainers, top losers, top volume, top turnover, 52 weeks high/low, etc. 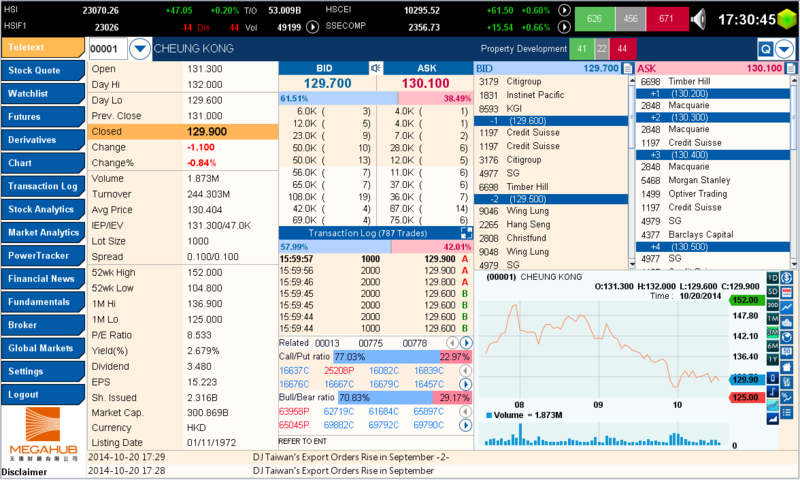 Displays the local Hong Kong indices, including HSI, HSCEI and HSCII with real-time charts and ranges for different time intervals. 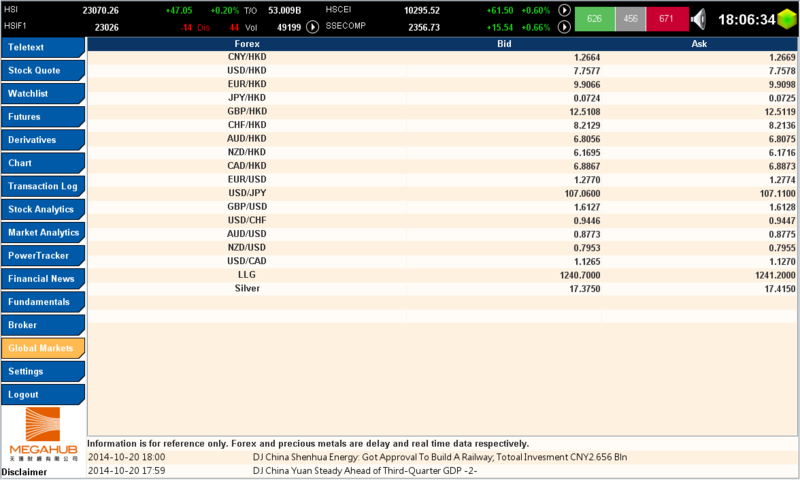 Users can view multiple global indices including in China and the United States to stay updated on the global market trend. 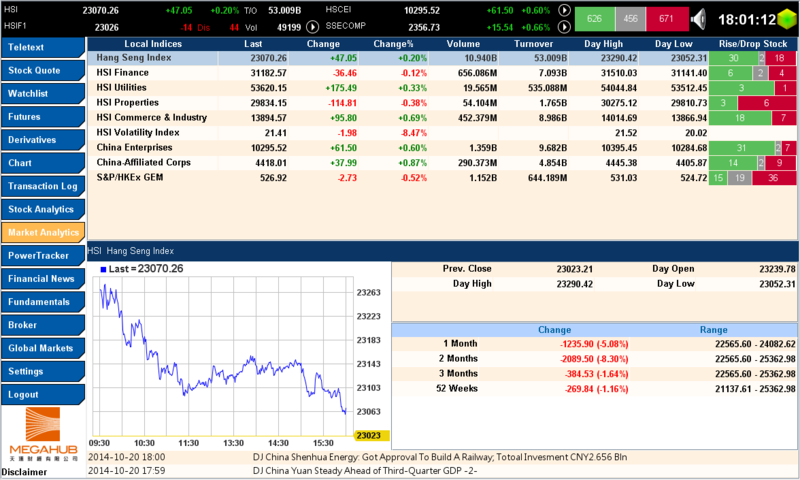 Shows constituent stocks of local indices, with nominal, change, volume, turnover, contribution to index change and more. The Estimate Index uses the same formula as HSI for per-second updates to predict the trend. 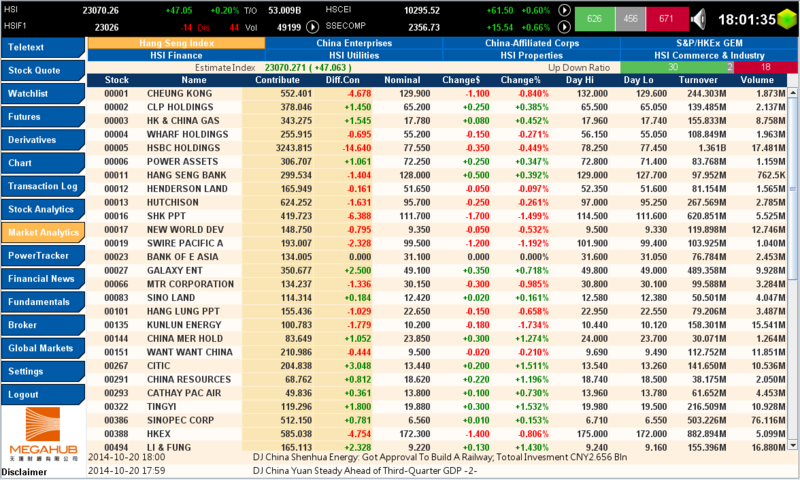 A summary of important dates such as result announcements, IPO, dividends, capital raised, securities repurchase, short selling, share split & merge, last trading date, and US economic data announcements. Check the historical performance of different sectors for selected time periods. PowerTracker is an algorithmic trading system which allows the user to monitor the market in real-time to catch trading opportunities. Build your own trading strategies with a combination of indicators and signals, all without the need for programming knowledge. Read global and local market news from reliable sources. Users can filter news by stock code to find related news. 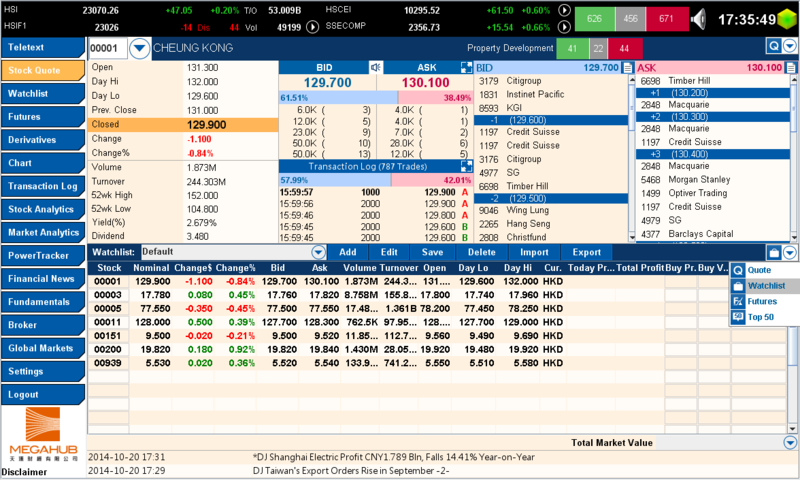 Provided by SHK Financial Data Limited, our database of company fundamentals includes comprehensive information on companies listed on the Hong Kong Exchange. The professional version offers 10 years of data on listed companies, with 21 categories and over 300 items. Search for brokers by broker code or name to see the broker bid/ask queue with related stock number, price and queue position. Displays global foreign exchange and metal rates.